Both self contained and shared rooms are provided at Camp JJ. Self contained rooms are completed with bath rooms, a queen size and single bed. The shared rooms are completed with bunk beds with shared bathroom facilities. Camp JJ operates a basic restaurant with local and western dishes on the menu. A main feature of the menu is the fresh trout from Betty’s farm is a famous which is located nearby. Fresh vegetable and strawberries are plentiful in the area and also feature prominently on the menu. The restaurant is also completed with a bar that enables climbers to drown their aches and pain with a good drink. 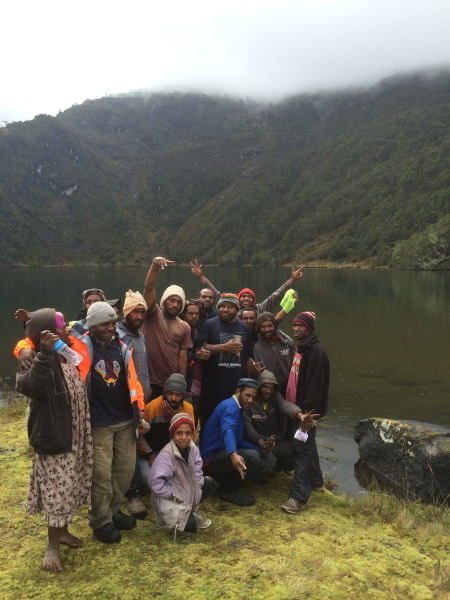 Most of the guides are trained and certified by PNG Tourism Promotion Authority (PNGTPA) and the training includes first aid and medical emergency execution and handling. The Company operates a convenient and souvenir shop that sells basic items that travelers normally need and also souvenir merchandise that climbers can take away in remembrance of their Mt Wilhelm climb experience. The Company also has facilities at Camp JJ that can sit 100 people comfortable conference and retreats. The Company can meet people coming in from overseas at the Jacksons Airport in Port Moresby and facilitate accommodation in Port Moresby and airport transfers to Mt Wilhelm via Mt Hagen, Goroka or Kundiawa. 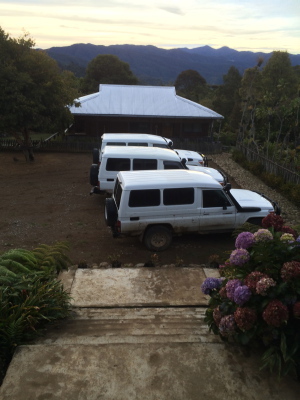 The Company provides transport pick up from any points in the Highlands including Mt Hagen, Goroko and Kundiawa. Pickups via the road can also be provided from Madang and Lae. The company also organizes village tours for tourists that would want to visit one of the local villages and would like to experience firsthand the daily livelihood of the local community. There are various cultural activities including the local “singsing” which is the traditional ceremonial dancing, courtship singing, traditional cooking displays, traditional musical instruments displays including the local “Kua Kumbas” and folk tales. There are bird watching sites that the Company is able to organize for bird watching enthusiast. Camp JJ has an Orchid Gardens which exhibits a collection of orchids from the Highlands region of Papua New Guinea.